Don't Let Small Problems Become Large Ones! Over the years, your automatic garage door system will most likely suffer from a few different malfunctions. It's the nature of these complex machines to eventually give in to their regular wear and tear. However, there is a way to prevent a lot of potential issues. 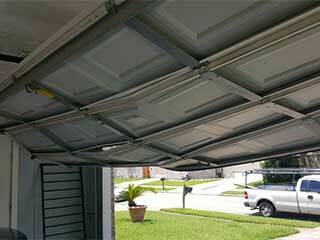 Garage door springs are in charge of supporting the weight of the door. That means they are far more likely to accumulate tiny tears and damages over time. If they aren't replaced in a timely fashion, they'll end up breaking unexpectedly, which can be extremely dangerous. Our technicians can routinely examine your springs and apply them with the right lubricant to ensure their operation remains smooth and efficient. An added benefit will be that they will suffer from less wear and tear, and will therefore last for much longer. Another thing will perform during our maintenance appointments will be to make sure your opener's safety sensors are aligned correctly. If these sensors become misaligned, they will fail to properly detect an obstacle in the door's path, which can lead to catastrophic results. We'll make sure they are positioned correctly, and realign them if that proves to be necessary. Our technicians will thoroughly inspect every single part of your overhead door. From the opener motor and circuit board, to the panels and even the pulley system. Any part that we discover to be in a less than optimal condition will be repaired or replaced on the spot. You'll be able to rest assured that your garage door is as safe as it can be. Don't hesitate to reach out to our experts at Garage Door Repair Elmhurst if you're looking for a regular maintenance service that can increase the longevity of your system. Call us today to schedule an appointment.